Stay Active- Even during the madness of the holidays, it’s important to stay active, keep your heart health in check and avoid excess weight gain. Try to do active chores around the house, taking your children to the park or even exercising for 15 minutes to reduce stress and keep yourself heart healthy. 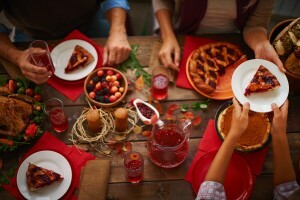 Eat Healthy- Before you dig into all of the delicious holiday’s meals and sweets, keep your heart health in mind. These heavy meals and sweet treats may have extra calories and sodium, so try eating a healthy snack before indulging these meals to fill you up first and give you the nutrients you need. Don’t Over Do It- It can be quite stressful working holiday parties, events and family get-together’s into your normal routine. During these times you may find yourself having to wake earlier or work later, but make sure not to overexert yourself. Try planning your days ahead of time and assessing what you need to get done and what things you can drop from the list to reduce stress. Drink Wisely- Most holiday parties and festivities typically involve alcoholic beverages, but that doesn’t mean you can’t still make healthy choice. Rather than choosing to drink a sugary cocktail, try choosing a red wine or club soda with your choice of liquor instead. Take Time for Yourself- The holidays are meant to be a joyful and reflective time. Make sure you make time to focus on yourself. Do something that makes you happy like meditating, reading a good book, taking a long bath or cooking something you love. Taking time to treat yourself helps minimize stressors and increases positivity. If you would like to learn more about living a heart healthy lifestyle, contact Dr. Gordon Gunn in Fullerton, CA at 714-912-2211 or visit our website at www.gordongunnmd.com for more information. Dr. Gordon C. Gunn proudly serves Beuna Park, La Mirada, Yorba Linda, Diamond Bar, Walnut and all surrounding areas.